Saturday was the hottest day of the year so far, and I’m happy to say that I managed to avoid the intense heat of the city, if only for a few hours. 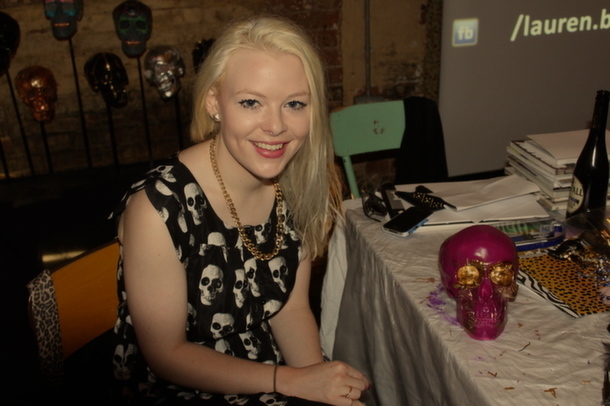 In the basement of an East London bar, with killer aircon and twenty or so people, I adorned a resin skull with the rising queen of skulls- Lauren Baker. 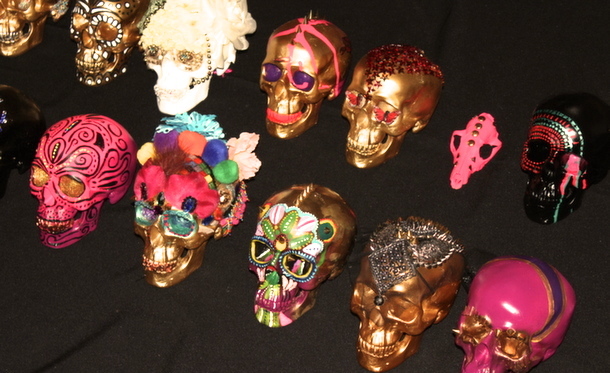 Artist Lauren has been running skull workshops since her very first at the Tate last year, and they’ve gone down a treat. I can totally see why, with her signature mosaic and day of the dead style, Lauren’s designs are completely en vogue, and utterly spellbinding, and you get to create your own, with Lauren there to help. The opportunity to work with Lauren in one of these workshops doesn’t come up too often, and my friend and I snapped up a spot on her July course, faster than a bullet from a gun. The spots fill up pretty damn fast despite the £60 course fee, so keep your eyes peeled for workshop dates on her website. 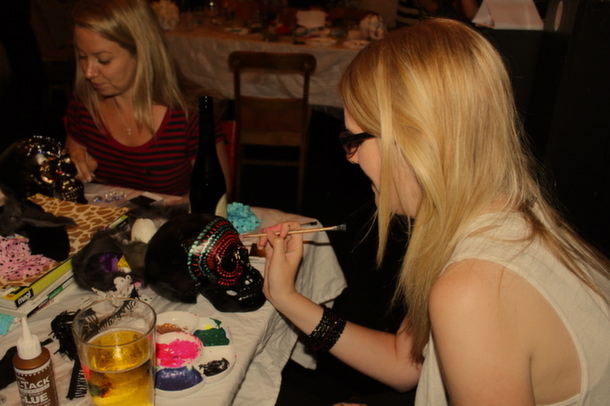 The course began with a short talk from Lauren about her history in art, (a spontaneous trip to South America opened her eyes to the world of mosaics and in turn skull insignia). 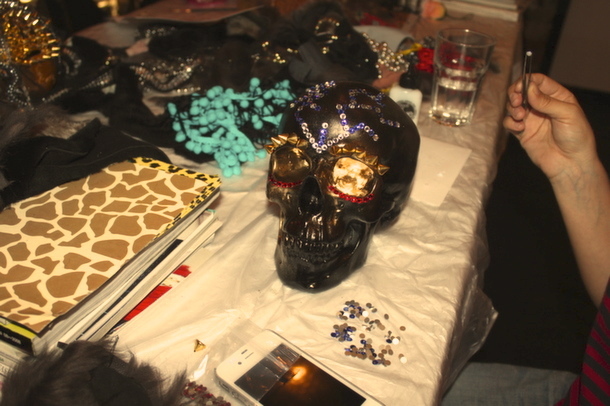 After becoming super inspired, it was time to choose our skulls from those on offer, and get to work with the adornment. 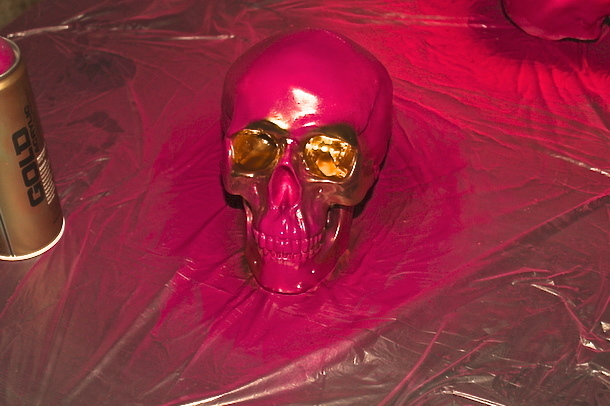 I opted to spray paint my white skull with a dark pink colour, and the spray paint station was set up ready for whatever paint job we had in mind. 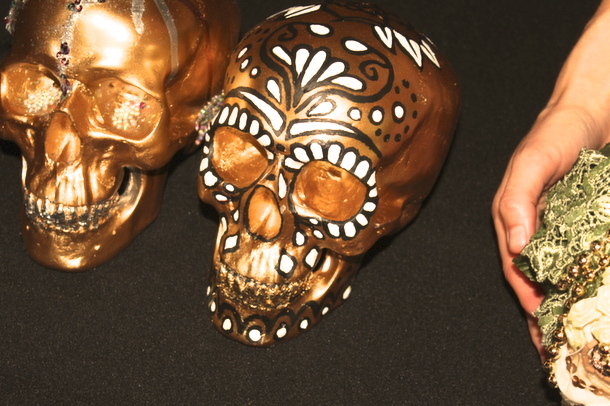 I then sprayed the eyes of my skull gold and let the paint drip down onto the front of the cast. I wanted to go for something edgy and spike-themed, so next it was over to the embellishment table to do some detail work. 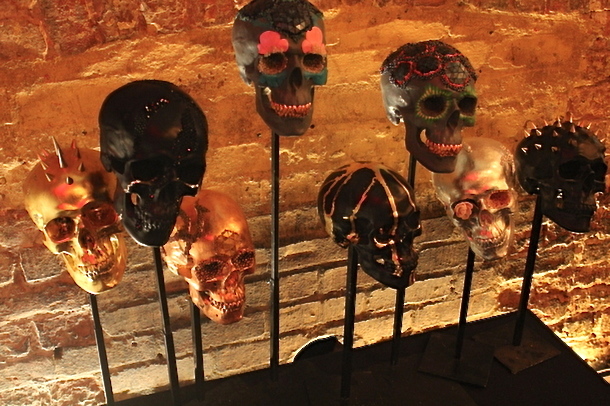 The materials on hand were massively wide ranging, and the fact that every single person’s skull came out 100% differently is a testament to the range of materials on offer. The detail work took some time, I applied beads and studs with tweezers and slowly built up my skull, finishing it with a purple and gold ‘swirl’ on the back of the head for extra interest. 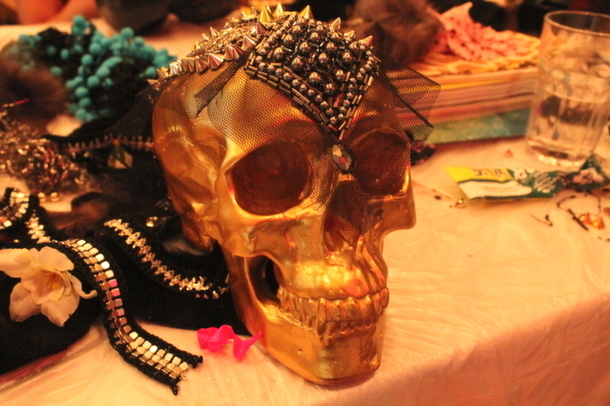 The standard was really high and there were a tonne of fab creations being made on all tables. 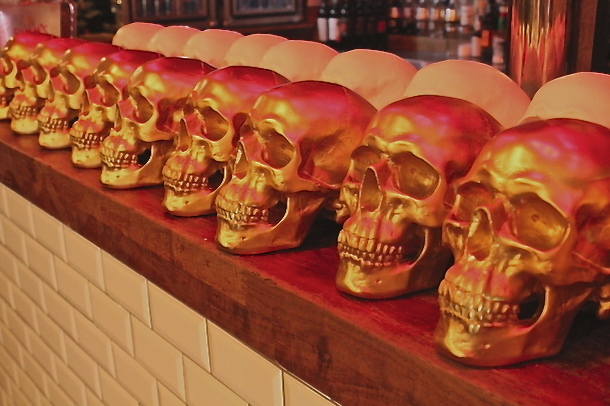 Lauren and her assistants were on hand to help the entire time, and everyone agreed it was money well spent for the advice and constructive criticism we were given on the way, and of course the skull was yours to take home at the end of the day. I was so happy with how mine turned out- it wasn’t at all what I had envisioned, it was even better! With beverages and snacks on offer and The Knife playing in the background it was a great way to while away an afternoon that was quite muggy and horrible outside! I’d highly recommend one of Lauren’s workshops, the 3.5 hours went by in a flash, and the skull you take home at the end of the day really feels like a special piece you’ve created in conjunction with the artist. 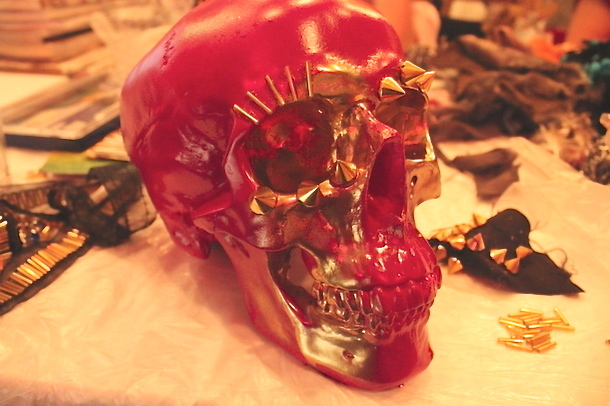 I definitely think the £60 price, which sounds steep initially, can be justified with the effort of the artist herself, the assistants and the vast array of materials available to adorn your skull with!